We can not stress enough the importance of carrying a spare tire while trailering. We have all seen it, the person or family stuck on the side of road waiting for the tow truck. Even if you stop to help them, if they don't have a spare, what can you do? Don't put yourself in that situation. Be prepared, and these mounts and will ensure your spare tire is in the correct spot, and covered. 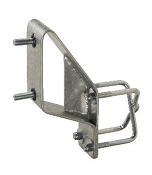 This Category contains spare tire carrier mounts and spare tire covers for all types of trailers. 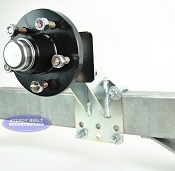 These Spare Tire Mounts come in a variety of mounts that attach to different types of trailers. These applications are bolt on application. We carry both zinc plated and galvanized spare tire mounts. These carriers will mount all sizes of trailer tires to your trailer. We have standard u bolt mounts, and offset mounts to cater to your specific needs. The most common two locations for these mounts are the trailers tongue, or frame rails. 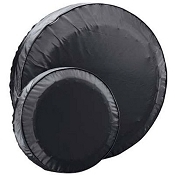 The Spare Tire covers are available for trailer tires sizes ranging from 13 inch to 15 inch, and will ensure your spare tire will be protected from the damaging heat rays while the boat is stored.